赵广明, 李钢柱. 内蒙古乌拉特中旗扎嘎乌苏岩体LA-ICP-MS锆石U-Pb年龄、地球化学特征及其地质意义[J]. 地质通报, 2019, 38(2-3): 349-359. 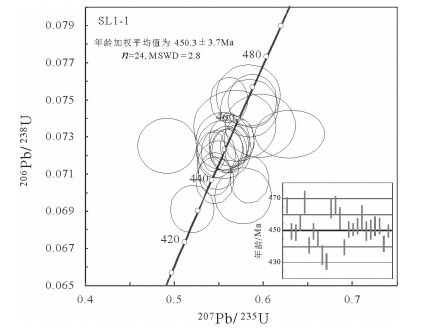 Zhao G M, Li G Z. LA-ICP-MS zircon U-Pb age and geochemistry of the Zhagawusu intrusive body in Urad Middle Banner of Inner Mongolia and its geological significance[J]. Geological Bulletin of China, 2019, 38(2-3): 349-359. Abstract: The Zhagawusu intrusive body is located close to the border between China and Mongolia and lies in northern Urad Middle Banner, Inner Mongolia. It mainly consists of diorite, quartz diorite, granodiorite and biotite monzonitic granite. The U-Pb age of zircons from the biotite monzonitic granite determined by LA-ICP-MS is 450.3±3.7Ma(MSWD=2.8).The rock samples are all characterized by strong enrichment of light rare-earth elements relative to heavy rare-earth elements, depletion of some high field strength elements such as Nb, Ta and Ti, high Sr, low Y and Yb content, and high Sr/Y and La/Yb ratios. The features indicate that the Zhagawusu intrusive body has a transitional normal arc/adakite geochemical affinity. The new age and geochemical data from the Zhagawusu intrusive body provide convincing evidence for Late Ordovician subduction of the Paleo-Asian Ocean in this region. Xiao W J, Windley B F, Hao J, et al. Accretion leading tocollision and the Permian Solonker suture, Inner Mongolia, China:termination of the Central Asian Orogenic belt[J]. Tectonics, 2003, 22(6): 1069-1089. Li J Y. Permian geodynamic setting of Northeast China and adjacent regions:closure of the Paleo-Asian Ocean and subduction of the Paleo-Pacific Plate[J]. Journal of Asian Earth Sciences, 2006, 26(3/4): 207-224. 童英, 洪大卫, 王涛, 等. 中蒙边境中段花岗岩时空分布特征及构造和找矿意义[J]. 地球学报, 2010, 31(3): 395-412. 邓晋福, 冯艳芳, 狄勇军, 等. 中国侵入岩大地构造图(1:250万)[M]. 北京: 地质出版社, 2015: 1-81. Jackson S E, Pearson N J, Griffin W L. The application of laser ablation-inductively coupled plasma-mass spectrometry to in situ U-Pb zircon geochronology[J]. Chemical Geology, 2004, 211(1): 47-69. Ludwig K R. Squid 1.02:A User's Manual[J]. Berkeley Geochronology Centre, Special Publication, 2001, 1-19. Sun S S, McDonough W F. Chemical and isotopic systematics of oceanic basalts: implications for mantle composition and processes. [C]//Saunders A D, Norry M J. Magmatism in the Ocean Basins. Geological Society. London: Special Publication, 1989, 42: 313-345. Sameniego P, Martin H, Robin C, et al. Transition from calcalkalic to adaditic magmatism at Cayambe volcano, Ecuador:insights into slab melts and mantle wedge interactions[J]. Geological Society of America, 2002, 30(11): 967-970. Defant M J, Xu J F, Kepezhinskas P, et al. Adakites:Some variations on a theme[J]. Acta Petrologica Sinica, 2002, 18: 129-142. Jian P, Liu D, Kroner A, et al. 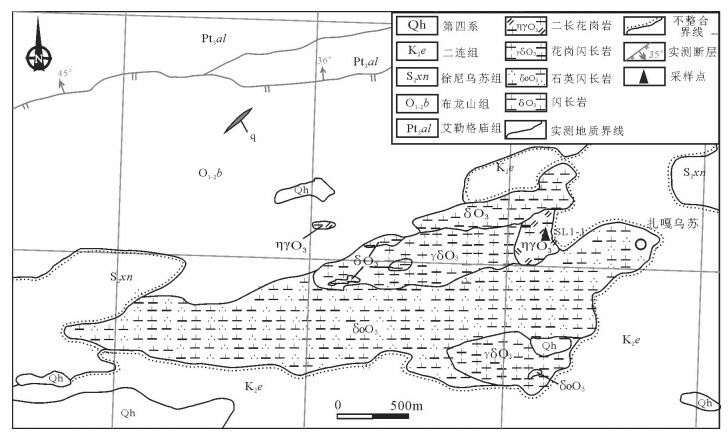 Time scale of an early to midPaleozoic orogenic cycle of thelong-lived Central Asian Orogenic Belt, Inner Mongolia of China:implications forcontinental growth[J]. Lithos, 2008, 101(3): 233-259. Jian P, Kroner A, Windley B F, et al. 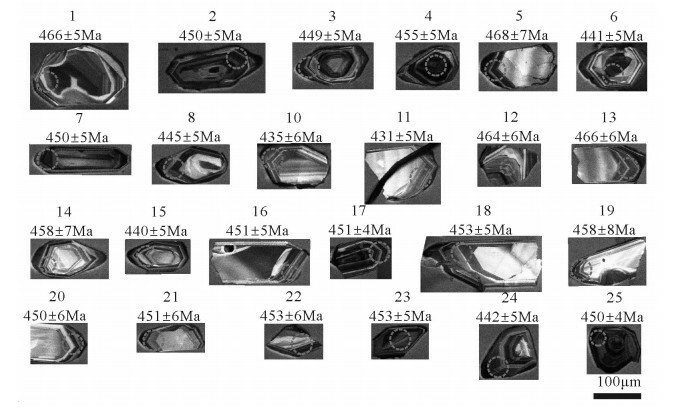 Carboniferous and Cretaceous mafic-ultramafic massifs inInner Mongolia (China):A SHRIMP zircon and geochemical study of the previouslypresumed integral "Hegenshan ophiolite"[J]. Lithos, 2012, 142: 48-66. 王挽琼, 刘正宏, 王兴安, 等. 内蒙古乌拉特中旗海西期黑云母二长花岗岩锆石SHRIMP U-Pb年龄及其地质意义[J]. 吉林大学学报(地球科学版), 2012, 42(6): 1771-1782. 范宏瑞, 胡芳芳, 杨奎锋, 等. 内蒙古白云鄂博地区晚古生代闪长质-花岗质岩石年代学框架及其地质意义[J]. 岩石学报, 2009(11): 2933-2938. 李朋武, 高锐, 管烨, 等. 内蒙古中部索伦林西缝合带封闭时代的古地磁分析[J]. 吉林大学学报(地球科学版), 2006, 36(5): 744-758. 王子进, 许文良, 裴福萍, 等. 兴蒙造山带南缘东段中二叠世末-早三叠世镁铁质岩浆作用及其构造意义——来自锆石U-Pb年龄与地球化学的证据[J]. 地质通报, 2013, 32(2/3): 374-387. 刘珏, 郗爱华, 葛玉辉, 等. 内蒙古赤峰地区蒙古营子花岗闪长岩LA-ICP-MS锆石U-Pb年龄及成因[J]. 地质通报, 2015, 34(2/3): 437-446. 潘桂棠, 陆松年, 肖庆辉, 等. 中国大地构造阶段划分和演化[J]. 地学前缘, 2016, 23(6): 1-23. 薛建平, 刘美玉, 李钢柱, 等. 内蒙古索伦山地区哈尔博格托尔TTG岩锆石年代学、岩石地球化学及大地构造意义[J]. 地学前缘, 2018, 25(3): 230-239. 李钢柱, 王玉净, 李成元, 等. 内蒙古索伦山蛇绿岩带早二叠世放射虫动物群的发现及其地质意义[J]. 科学通报, 2017, 62(5): 400-406.